Slave trade in 2014 is flourishing in South and South-East Asia. The victims are often from minority groups being persecuted by their own governments or being denied statehood. Many are simply exploited for their dire poverty. The practices used by those who trade in people today are not too different to the practices used centuries ago. Afsar Miae, a 20-year-old rescued Bangladeshi interviewed by Reuters told of how he had expected to return home after work that day. Instead, upon arriving at work, he was given a drink of water, which made his head spin and eyelids heavy. The next thing he remembers is waking up in the dark, his hands tied and eyes blindfolded. Kept in darkness, he describes being regularly whipped by guards, surviving off dirty water and scraps of food. Two other men from the same rescued group describe how the hatch to the hold was only opened to remove dead bodies. Victims are smuggled onto small, local fishing vessels first. Once these fill up, they are then transported to large boats holding up to 700 people outside Bangladesh’s maritime boundaries, in international waters. From there, they are brought to the jungle camps of Thailand, watched by armed guards the entire journey. These serve as holding stations whilst a ransom is extorted from their impoverished families to the tune of US$2,500 per person. Those who manage to pay are allowed passage to Malaysia. If the men held a glimmer of hope at the prospect of a livelihood in Muslim majority Malaysia, they were in for a rude awakening. Once in Malaysia, the trafficked men are sold to owners of plantations, construction firms, seafood production companies or factories ‘to work off their debt’. Afterwards, then earn less than what they did back home, under extreme physical threat. The Andaman coast has been a highway for traffickers for some time. It used to be that many boarded the boats voluntarily, seeking a better future. Until early 2014, it was stateless Rohingya Muslims from Western Myanmar that were being exploited, but with competition between crime syndicates intensifying, Bangladeshis and other minority groups have become the latest victims. A record 40,000 Rohingya passed through the Thai camps in 2013, reports the Arakan Project, a right’s group monitoring movement of people in the region. And in a series of raids this year, police have found hundreds of Bangladeshis as well as Uighur Muslims from China’s northwestern province of Xinjiang. 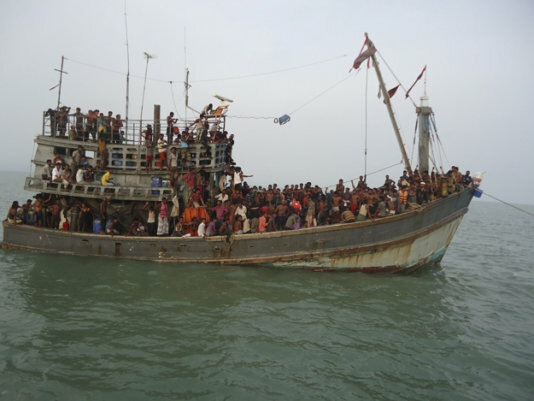 The group estimates that more than 50,000 people were smuggled from Myanmar and Bangladesh alone in 2013. The Bangladeshi government, consulted by the International Organization for Migration (IOM), is currently working to develop a National Anti- trafficking strategy. Police there say that they have freed roughly 100 people a week in their stepped-up coastal patrols since the end of September. Local NGOs are trying to harness the influence of religious leaders by enlisting their help in raising awareness. Local imams have begun to organize community advocacy groups as well as watchdog programs to prevent trafficking. The police report having deported thousands of undocumented workers on construction sites and factories as part of a crackdown on illegal immigration. The Thai government who seized power from an elected government earlier this year promised to fight trafficking. Yet five months later, even higher numbers are being smuggled, and that too, using any means necessary. A smuggler based in southern Thailand spoke on condition of anonymity and paints a picture of a thriving slave trade. “The camps are running very smoothly,” he said, estimating that eight large camps holding 2000-3000 people at a time were in operation. A series of Reuters’ investigations in 2013 may explain the Thai government’s poor progress, to an extent. It revealed the complicity of some Thai authorities in smuggling Rohingya and in deporting the trafficked back into the hands of human traffickers. In June, Thailand was downgraded to the lowest category on the US State department’s list of the worst human trafficking centers, putting it in the same category as North Korea and the Central African Republic, essentially prompting trade sanctions with the US. People smuggling across the Bay of Bengal is at its height at this time of the year and numbers are expected to skyrocket in 2014. The victims are being brought to jungle camps on Trawlers, watched by armed guards the entire journey. After the trip on a boat the victims are held in jungle camps.